As a MS Project MVP for the last 15 years, I am passionate about sharing knowledge and helping people maximize their project to portfolio management capabilities with technology, especially when they are using MS Project. I’ve seen a growing set of questions surface regarding Master Projects, so with MPUG’s help, I’m looking to share some thoughts and approaches that hopefully you will find helpful in your use of this great tool. Are Master Projects Viable in an Enterprise Environment? Master Projects have been a part of MS Project since the late 1980’s. In fact, long before there was Project Central Server, Project Server, and now Project Online, there was only the ability to create Master and Subprojects with MS Project. A Master Project allows you to create a consolidated view of multiple files, update tasks across multiple files, link tasks across different plans, and also do reporting and analysis across different schedules. A question that I find comes up quite frequently is this: Is there a reason to still use Master Projects now that in today’s world of solutions by Microsoft, including on-premise (Project Server), Office 365/Project Online, and Azure, we are provided with enterprise options? While all enterprise environments provide essentially a Master Project environment (by bringing all files and data into a consolidated database), the short answer is that yes, there is still a use for Master Projects in conjunction with them. I want to share some key factors and approaches that Advisicon and our customers use that will help you continue to utilize this powerful approach even if you are using an Enterprise version of Project. When it comes to building or using Master Projects, one key thing to remember is that they are containers for surfacing information. That may mean you would create a Master Project as a temporary window to work on multiple files at the same time. You may save the changes to the subprojects, but not the Master File when you are done. You could also use a Master Project as a quick container to allow for opening and editing of regular files you work with. Do note that while working in a Master Project, the whole concept of the “Project Center” in Project Server or Project Online is that it is a Master Project. What I typically encourage users to factor in is that Project is a relational database. If you want to have file level properties or metadata fields at the project level, but are looking at rolling all of those up, Project Online (Enterprise) or Project Server (On-premise Enterprise) may come into play. In an enterprise environment (Project Server or Project Online), you can group entire files by their properties, functions, and/or owners. This allows you to use reporting tools like SQL Server, Power BI, Tableau, etc. to mine and model the data. One concept for thinking Portfolio View of Initiatives is for those working in MS Project Desktop, who may not have access to an enterprise environment to create a Portfolio View in a single file. 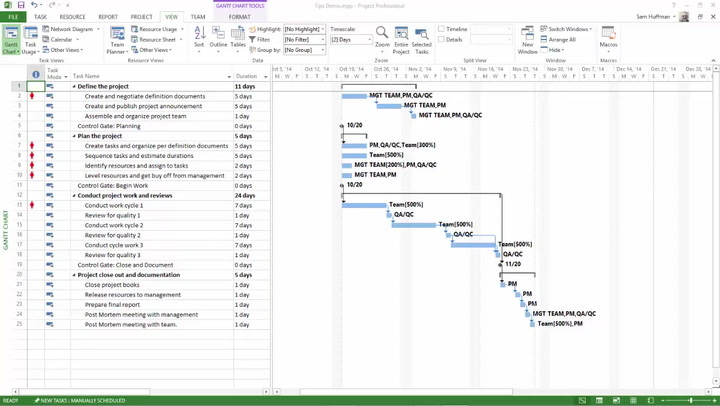 Whether you put all of the projects as sub-projects, or you simply represent each schedule as a single line in a single Project file, you can do a lot of modeling and resource/cost planning. Here is an example of a Single file that is representing a key work stream or initiative, but for which each row is a project. Typically, there are no details around this. If you do have access to an enterprise environment like Project Server or Project Online, you can simply use the native Project Center views to showcase, group, rollup, view, and/or drill down to any projects that are included in that view. If you want to build Master Projects, there are several approaches. Quickly spawn a Master Project through the View Tab by selecting New Window, as shown below. We find this very common when you want to link or view many open files at the same time, but don’t want to save a Master Project (as its own file). The other option is to use the Project Tab and to insert a project as a subproject of the existing file you are in. By choosing Unlinked, you can create a snapshot or an archivable copy of an existing file. This is as if you copied and pasted the data in, which I find much faster and easier. So, the big question is why continue to use Master Projects if you are working in an enterprise environment? There are several key reasons. You still need a Master Project to link across multiple or different files. This is probably one of the most common reasons for a Master Project. You want to do quick analysis, viewing, and possibly reporting using Project Desktop across multiple projects. You can still use the Power of Project Professional to view information vs. having to go elsewhere for reporting and analytics. In an enterprise environment (Project Server or Project Online), you may have the need for a lot of custom fields, views, filters, grouping, and reporting that may not be useful to the rest of the organization. If these custom fields, views, or objects were created in the enterprise edition (meaning available for everyone), it would actually slow down or over encumber the enterprise environment with objects or fields that are only valuable to one group. It is true that you can create different views, fields, security, and functionality for multiple parts of an organization in Project Server / Project Online. Basically, it’s like having multiple enterprise environments all housed in a single enterprise environment and connected to a single resource pool. Remember, though, that every custom field you add will remain there and is potentially available for everyone. This could be either good or bad if you have large project schedules (thousands of lines) and aren’t needing them for your organization. The overall concept is to ensure that certain groups can still use their local custom fields standardizing any customizations across the other files or schedules associated with them (like Text 12 field is the same customized field across everyone). This approach allows you to still have pockets of customization, viewing, filtering, and reporting (like you did pre-enterprise version of project). At the same time, though, you are ensuring that you aren’t over engineering elements in an enterprise environment that may not be useful for the entire organization. I know this conversation can go deeper, but this approach has been used by many of our customers to allow them the flexibility of using customized objects. It’s easy for them to then pull them into a Master Project for planning and viewing, while still also using the enterprise version of Project. Be sure to watch my on-demand webinar on the topic to learn more. Whichever your approach, just note that you can leverage the power of both the Enterprise edition of Project and the Local Master Project capabilities together. If you are interested in more, or have questions, please reach out to me directly at Tim.Runcie@Advisicon.com. Thanks for another great article Tim. Our shop is looking forward to the webinar! I’ve used Master & Subproject structures for years. When Central, then Server came along, I moved away for this use. I’m now in an environment without Server and recently went back to the old ways. The Master/Subproject structure worked fine for my project needs. 27 teams were involved in a significant project, and I had each team lead responsible for their own project (subproject) file. There are always challenges when the “update time” comes, and I have to pull all those project files together. Usual user errors were re-use of defined fields, or misnaming the whole MPP file. But, you can work around those. Thanks for revisiting an old but useful (still) capability in Project. Can you insert sub projects into a Master Project file using SharePoint Team Project Sub Site project files (stored as site assets within various sub sites) via SharePoint 365 and Project Professional 2016? I have synced several project files to my team site as project sub sites, but cannot seem to insert any sub projects currently housed on a SharePoint Team Project sub site (as site assets within the sub site) into a master project also housed similarly on SharePoint. Is this just not a capability of the tools I have access to? Is this supported in another version of Project? Do I need to structure the files differently somehow to make a master project sub site part of my team site? Any help would be greatly appreciated! Hi Rachel, Typically you do not try and embed a Master Project from a SharePoint Document Library. What you are trying to do is normally accomplished with Project Online or Project Server (as an Enterprise). This is where you would and could embed Project Schedules since you are Publishing them into the Enterprise Environment.